Last round of Chinese culture, several of you gushed over how pretty Chinese characters looked. And I'm tempted to agree, even if I hate the complex strokes during examtime. Hence, today we discuss calligraphy. There are actually many, many types of writing the same word. Now, this isn't like the difference between traditional and simplified Chinese. It's more like the difference between cursive and print and caps. Psst, because I am lacking in the handwriting department, I referred to this article. Images click through to their sources and do not belong to me. Personally, I feel like this is the easiest one. It's fairly similar to typical handwritten characters, except it's a lot neater and rigid. There are a few embellishments, especially with the dots — compare the bottom right character to its Times New Roman counterpart: 為. The dots have an uptick to create a more artsy feeling. Emphasis is also placed on where the pressure is applied more. This makes that nice stroke that Times New Roman simply cannot emulate. I tried to in my sample below. Did I succeed? You tell me. This one I can never get the hang of. All the strokes are so flat and long, and even though they're recognisably the same characters, mine always end up being unsymmetrical and disproportionate. It's apparently called the clerical script. The stroke ends on this one are elongated with a thicker finish. 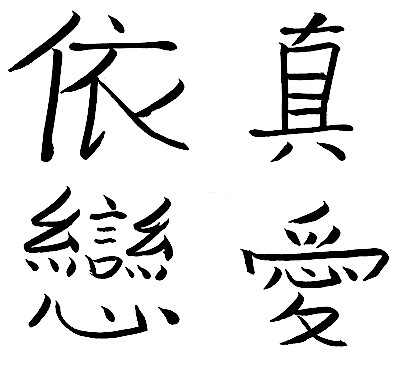 They also have some more embellishments; check out the one that's fourth both from the left and top, which is written as 終 in its contemporary form. You think I am kidding about messy? I AM NOT. I literally cannot read the words in the image above. It's called "grass font". As far as I can tell, there are no rules in this one. It's for the artists out there, I suppose. This is read vertically, just, y'know, FYI. I debated so long whether to put this up. I'm sure this merits maybe a D+ in actual calligraphy class. But this series is meant for my sharing of Chinese culture, not just copying and pasting web resources, so here we are. I also cheated, since I didn't use a real brush and ink for this. Just a modern imitation called a "scientific ink brush". How terrible is my calligraphy? And what does Junrai's name mean? Sooo, WTA news will be scarcer from now on, but if there is any, my takeout army will be the first to know. So join us now! Also, forgot to ask, but do you write vertically for exams? Korean looks super pretty AND simple at the same time, which is a relief when I can barely read some Chinese characters in their boxes XD The messy one is very artistic if illegible, and aww, thank you. Yes! I absolutely go into RAGE if someone says a fictional character or culture is supposed to be pan-Asian because ???? What is that even supposed to mean? I think your calligraphy is really pretty. But then again, I don't know anything in Chinese so maybe I'm not really qualified to answer that :P Still, though, I like how your characters basically look like pictures. And Junrai mean love, which automatically makes it a beautiful name, indeed. Thank you so much, Precious! I personally maintain it's terrible, but your kind words still mean a lot. And yeah, I love how you can sometimes see the actual thing you're depicting. *coughcough* I doubt anyone who's read the ms will find it that beautiful. Probably I shall receive murder threats shortly. I feel like you telling me your calligraphy is bad is kind of like telling a deaf person that your singing voice is bad. Like, I can't tell. I just think it is all very pretty (I think we might have a painting with a messy font in my parents' bathroom. Although, it might not even be Chinese. Blah. So uncultured am I. Still, the letters are lovely, I think the flattened kind is my favorite, although I don't think I'm good enough at this business to think that your calligraphy looks bad. Thanks for sharing it with us, anyway! Anyway, I liked Junrai's translation. :) My only thought was like "stud" or something, which would be awkward. But it's all tilted and unsymmetrical and I did like three drafts and still had to Photoshop it, so allow me to assure you, it really is somewhat terrible compared to typical calligraphy. And hey, the point of these posts is to share my culture, so it's good that you're learning something. For a minute I was afraid that the unromantic pairing was YlenxJunrai and I was like EW SHE CAN'T GO OUT WITH HIM and then I remembered that Talisa still exists in the story even if you didn't mention her in this post. Lol. Um, yeah, your writing looks amazing! Although my eye is obviously untrained and useless, but STILL. I think it's pretty :) Now, a question: do most people learn calligraphy? Like, is it widely used, an everyday thing, or is it a specialty? Also, I did translate, and it means love! So sweet! Thanks so much for sharing all these lovely cultural posts, I really enjoy them! Oh my, I'm terribly amused by that Radcliff gif. I'm guessing it was from SNL? His wig is awesome. Now I can't stop laughing. This is such a wonderful post! I really enjoyed looking at the different caligraphy types and the range of characters. Languages and their different alphabets are so interesting to me, so this was doubly fascinating. I really liked reading your thoughts and comments on this, too, and I agree with Shannon. Your writing does look truly gorgeous. I'm not sure where it's from, actually XD But it's been floating around the Internet. I'm so happy you found this post interesting, and multilingualism is always cool. And thank you!! ... I'm afraid it doesn't relate in such a positive way, as you can see from the comment below. I...couldn't tell the difference between good calligraphy and bad, so this might not mean anything. But it looks beautiful to me!